Batman- The 1989 Film: Special Feature: 8-to-9 Questions With... Makeup Effects Wizard Nick Dudman! 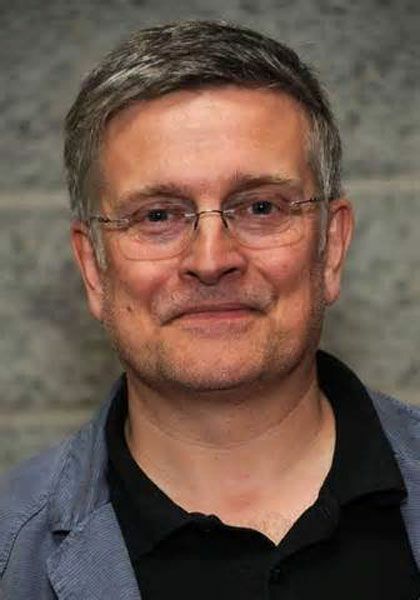 Makeup Effects Wizard Nick Dudman! Hey everybody! 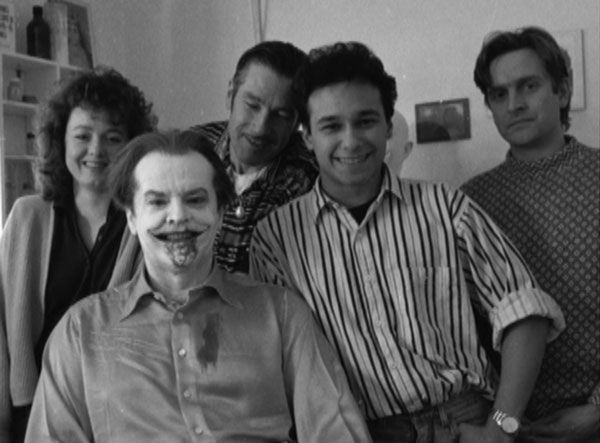 Welcome to the very first installment of a new feature here at 1989Batman.com- Interviews with the cast and crew that brought us both "Batman" & "Batman Returns"! These interviews will randomly pop up here at the site, with each one staying under 10 questions. I'm calling them "8-to-9 Questions With..." as a play off of the whole '89 thing. 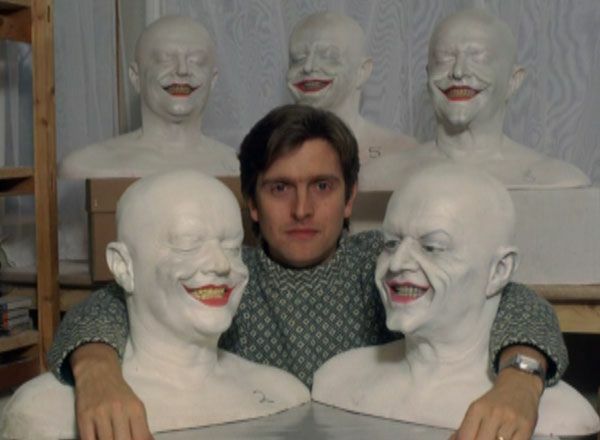 :) For this opening segment, we have a chat with the man who gave Jack his mischievous smile, multi-award winning makeup effects artist Nick Dudman! 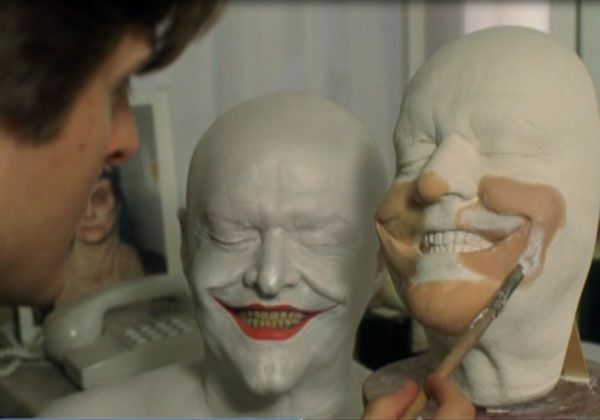 1989Batman- Can you tell us how you first became involved in the makeup effects industry? Nick- I studied film and TV production at college. When I finished, I found my makeup skills were more in demand than any camerman skills I thought I had! I pestered a makeup artist name Stuart Freeborn (who worked on "Star Wars") for a job. I became an assistant on "Empire Strikes Back" at Elstree studios. The first thing Stuart had me doing was building control systems for Yoda. It was quite a start! He then took me onto "Superman II". 1989Batman- Ah, so "Batman" wasn't you first superhero flick? Very cool that you have worked on both of DC's major comic book movie franchises! How exactly did "Batman" come about for you? Was there a "pitch" process or were you just offered the job? Nick- I had worked with production designer Anton Furst on "High Spirits" previously. He asked me to drop by for "Batman". It believe it was between me and one other guy, I got it, but only after meeting Nicholson at the Dorchester and passing his approval. 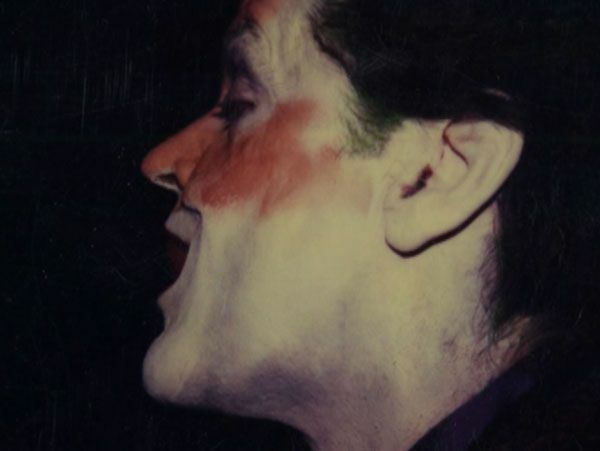 1989Batman- Obviously, the look for the character already had a set of established parameters before the film (white skin, large smile, green hair, etc), but were there any specific notes or reference from production on what they wanted Joker to look like in the move ("don't do this", "make sure he looks like this", etc)? Was any specific artistic reference provided? Nick- There was no reference apart from the comics. The brief was clear- The makeup had to be achieved in 2 hours. Any longer, and it wouldn't be workable. Oh, and Jack would the final say on the look. 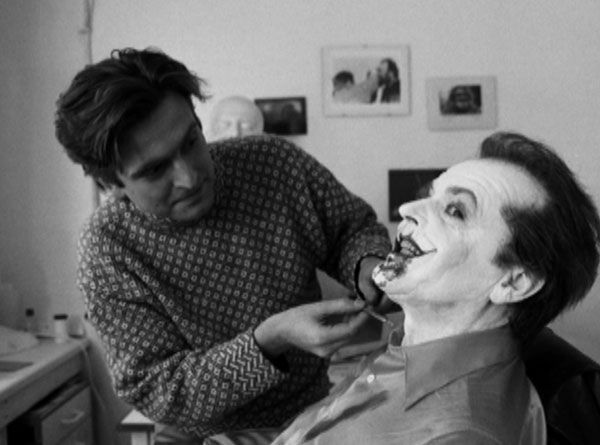 1989Batman- Take us a bit into the design process for the Joker makeup. How did you settle on the final look? What kind of input did Nicholson have in the process? Nick- I went to Burbank to get Jack's lifecast. I took one smiling, one neutral, plus plenty of pictures to see how he smiled. We did it all at Tom Burman's shop (he and his wife were brilliant). 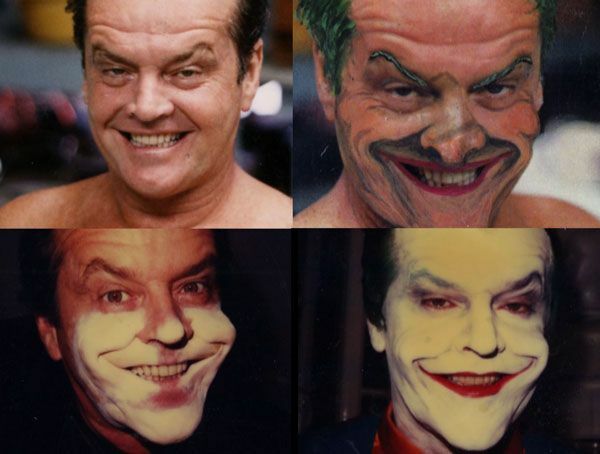 I then sculpted five different looks from subtle to extreme and showed them to Jack (since he had final say). Luckily, he chose the one I hoped he would. 1989Batman- What was the typical length of time for the application process? Were there any major difficulties you can remember with the makeup? Nick- The process usually took 2 hours. There were no issues really. It was glued on with 355 silicone adhesive so no gum allergies would arise (Nicholson is allergic to spirit gum- 1989Batman). The hardest thing was arriving at a "white" that worked on a dark set next to a guy dressed in black rubber. That took some testing. In the end, we heavily shaded it with a metallic gunmetal. 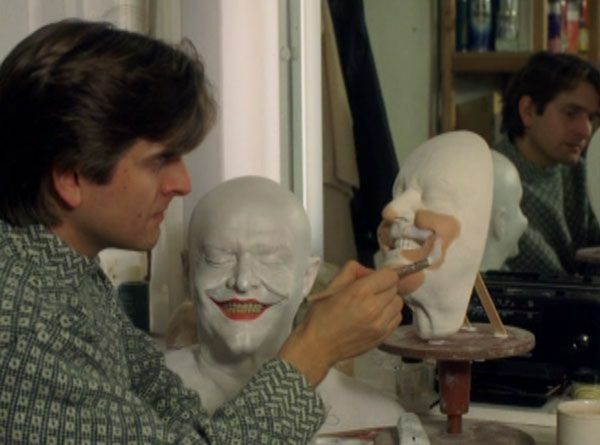 1989Batman- I have always marveled at how seamless the effect of Joker losing his face paint and having white skin underneath appeared in the film (both when he wipe it off his brown and when Vicki tosses water on him at the museum). Can you explain how this effect was achieved? Nick- That was a game! I applied the whole Joker white makeup and then painted a layer of food grade silicone liquid over it. This is the same stuff they polish fruit with which means nothing will stick to it. I then stippled on old-fashioned foam rubber grease paint over it. The grease paint was flesh-colored and would move about as it could not key to the silicone liquid. We then soaked Jack's handkerchief in alcohol. He wiped the flesh-colored makeup away, while the white pax paint was protected from the alcohol by the silicone. For the museum scene, It was just handled by clever editing. Jack was made up in white, then I dressed some flesh color over in places and he smeared it about with his gloves. 1989Batman- Were you also responsible for Alicia's disfigured makeup in the film? Nick- No, this was done by the straight makeup artist Paul Engelen... Although I did make her mask. 1989Batman- Billy Dee Williams portrayed Harvey Dent in the film... A role who he accepted with the hope of eventually playing Two-Face in a sequel. Were there any talks or thoughts about the Two-Face design during the production of "Batman"? How would you have handled his look had you been given the chance to work on the character? 1989Batman- In 2005, you returned to the Bat-franchise with your prosthetic and costume effects work on "Batman Begins". How did it feel coming back to Batman? What are your feelings on that series of films versus the Burton Batman installments? Nick- It was definitely fun seeing a Bat-suit again. I think the latest series really achieved something in bringing the character into the modern world. Our movie was really more of a self-contained place. ...And that concludes the initial installment of "8-to-9 Questions With..."! A HUGE thanks to Mr. Nick Dudman for taking the time out to chat with us! To check out more on Nick's IMMENSE portfolio of film work (you won't believe all the films he has been involved in! ), head over to NickDudman.com! I CAN'T BELIEVE that no one has commented on this great interview! Thanks for talking to Nick and sharing it with all of us. This is such a fantastic behind-the-scenes look at someone directly involved with the film. Looking forward to see more interviews! Was there an appliance in Jack's mouth to stretch his mouth wide like that? It always looks permanently stretched in the film. Maybe there's something in his mouth pulling apart his cheeks? Hi, do you have an email I can contact urgently? We're doing a making of the movie piece and these images are fantastic! We would love to use them in the article.